Writing great content is obviously a huge key to success with Blogging – but great content alone isn’t enough. You need to keep SEO (Search Engine Optimization) in mind, and ensure that the search engines are finding your articles and they work to drive new, organic traffic to your blog. SEO is the process of improving the visibility of your blog or website in searches via organic (unpaid) search results. Or simply put, getting your blog discovered! The higher your blog ranks in the search results, the more visitors you will have to your site. Think about it, when was the last time you went past page 2 on a search term on Google or Bing? It’s really rare! If you are not out there under the terms you want people to follow you under, then the possibility of your content being seen is so much lower. Unless you are writing for the fun of it, and don’t care if people read your posts, it helps to know what search terms people are looking for. – Research actual keywords and phrases that people enter into search engines when planning your blog post. Google Keyword Planner is a great place to start. – Don’t waste time going for high competition keywords. Chances are that you can still compete with some thought. – Focus on mid to low-competition keywords and key phrases that the average person is likely to look up. Post titles are incredibly important in SEO. You want to use your Primary Keyword or Phrase in the title with less than 72 characters and a minimum of 4 words. Keep your titles short and to the point, if you can. Approximately 40 characters will ensure the entire title appears in search results and many blog templates will truncate (cut off) long titles. Meet a need that people are searching for and are likely to type in. “How to…” “21 ways to… “ and other list and phrases are a sure bet on search engines. Generally, you won’t look up “eye cream” but rather “how to make skin look firmer” or “how to get rid of crows feet”. By understanding how people use search engines, you can find a great match for how you write. In many templates, Genesis, for example, you have extra SEO spots that help tell Google what you want it to display. On my article about Time Management, I have a spot to show Google how I want it to show up. I fill this out with my post. 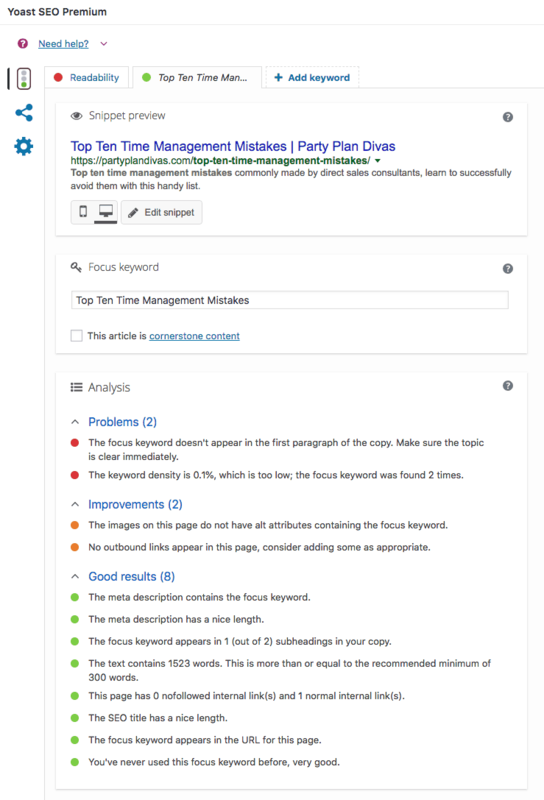 If you are using Yoast, you can edit the Google Snippet and even get recommendations for how to improve your search engine rankability. The description of your post should be a maximum of 165 characters and offer a brief synopsis of the content of your post, including Primary Keywords. Inside each post, you have the option to create titles as well. 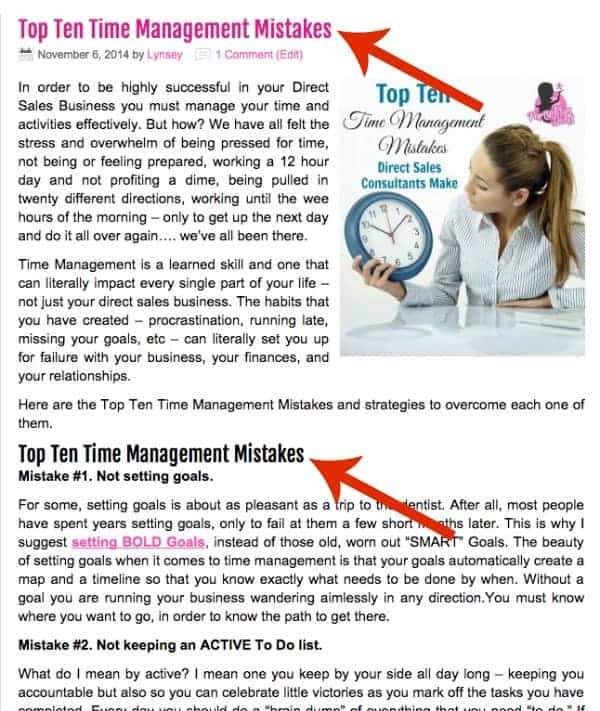 Breaking up text into smaller bite-sized pieces and using Title Tags help separate what is important to your readers and to search engines. If you want your article to be found based on your keyword or phrase, it’s important that your article has relevance. Repeat the keyword or phrase within your article, but don’t keyword stuff your post. It will become ‘spammy’ to read and less attractive to your readers. Additionally, the search engines are wise to this and will black ball your site. Try to use different phrases in different areas of your article to bring more relevance. Use quotes, lists, descriptions, and personal experiences. Opinions vary, but it’s generally recognized that very long and extremely short posts are not ranked as high as those of ‘reasonable length’. The general opinion is that a post with approximately 500 words is considered optimum. Can’t quite stretch to 500 words? That’s fine! Not every post you write will necessitate 500 words – and that is ok. But try. Consider including quotes from others or even post on your Facebook page for more feedback on the topic, which may then inspire additional content for the post. Have waaaaay more than 500 words? 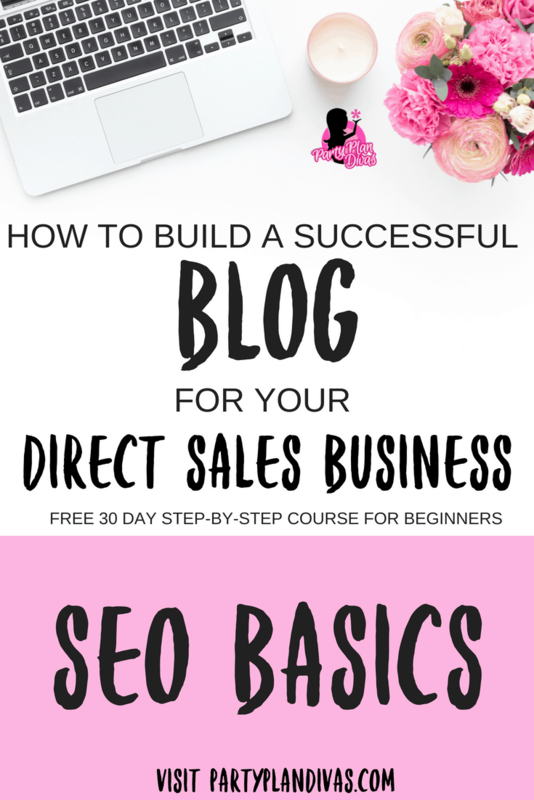 Consider breaking it up to create a blog post series! Many times bloggers will write several articles on the same topic. If you do that, make sure you interlink your posts. The first, most BASIC thing you can do for SEO is to make sure that the page/post urls are easily “read” by these search engines. To do this – you must change your “permalinks” within your dashboard. (www.yourdomain.com/yourpostitle). 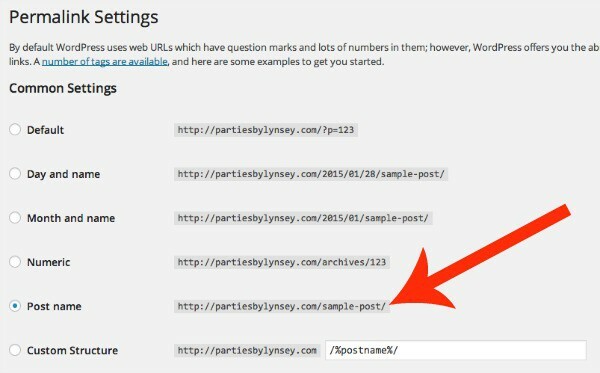 – Edit your blog post permalink title before you publish your post. Rename any default title that may have been auto-applied. – Ensure your permalink contains your keyword or phrase. On each post, it will auto use your post title to develop your permalink. You can EDIT this and make it shorter and more keyword friendly. Your blog and its content is a connection with your reader. It’s an opportunity to engage. Don’t focus solely on your keywords and article length. Those things can be important and are for long-term growth and exposing new readers, but it’s also important to write with your reader in mind. Connecting leaves a lasting impression unlike anything else. Go back and edit any posts you may have to make sure they are optimized for Search Engine Ranking. Otherwise, write a new post using the tips above to maximize your search exposure.